Adorn your home and special event with wreath decorations and wreath arrangements for a stylish touch. We have sourced natural wreaths that are easy to use and decorate with extra accents to suit a variety of themes. Choose from natural woven wreaths to natural willow wreaths in a variety of colours and sizes. Every season, we introduce up-to-date designs to be ahead of market trends, including wreaths especially for Christmas and Easter. Everything that we sell is top quality and at wholesale prices, because we import our products directly. 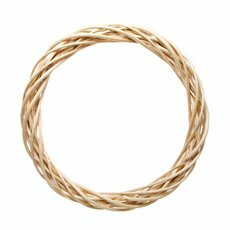 Our natural wreaths are woven from a range of materials, including willow and rattan. Use our natural wreaths as a blank canvas for your DIY projects and other creative ideas. Wreaths are a great starting point for florists, hobbyists and DIY enthusiasts. Perfect for the front door, shop displays, feature walls, photo backdrops and more, reimagine the way you use a wreath for your next event. You can also opt to place each wreath as a table centrepiece with a flower arrangement or candle in the centre. Explore the many ideas available when you peruse our range of easy to use and durable wreaths at affordable wholesale and retail prices. With nationwide delivery available, we are the industry leader in wholesale florist supplies, including willow wreaths, rattan wreaths and more.